Another great summer and getting wet is an essential part of it, writes parenting columnist Ian Munro. 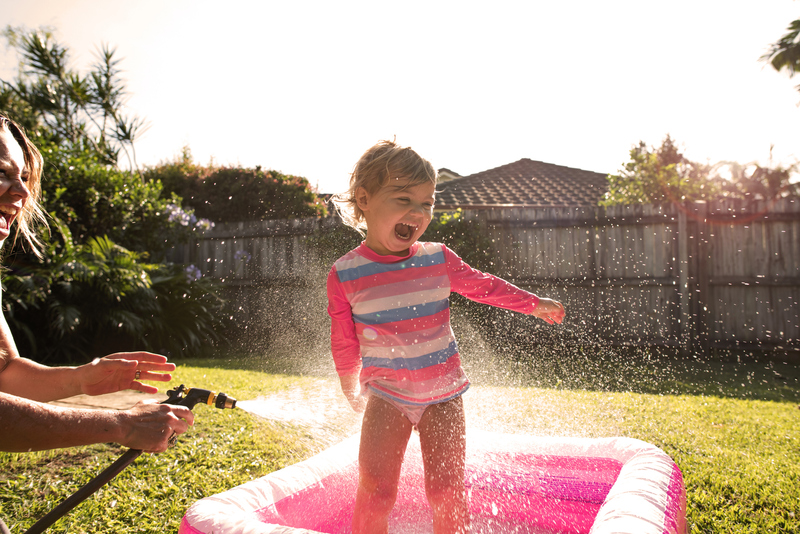 I've talked in the past about the part bath-time activities can play in babies' brain development, and now's a good time to take those water activities outdoors. An inflatable pool is the obvious way to do this with lots of things to fill, pour, squeeze, squirt and float. There's a great variety of items that can double as play equipment - plastic funnels, tubes and boat sponges make great toys. Every hand action and the co-ordination required to use these things is excellent for tuning the brain's motor circuits. And nothing can beat a sprinkler, hoses with nozzles, or water pistols for getting the laughter going, while a paintbrush and paint bucket filled with water allows toddlers to paint the house or fence, or write on concrete. A wet plastic sheet makes a perfect DIY slide and water balloon target practice guarantees everyone gets wet eventually. Water play means always being on hand. Occasional glances from the kitchen window won't cut it. It's too easy to have your attention drawn away by what you're doing for that crucial moment or two. Be out there with them. Being outdoors also means sun protection. A wet little body is very susceptible to burning. Balls are also great for brain development. Soft, hard, large, small, bouncy - whatever sort, they're great learning toys. For a baby, choose brightly coloured, soft balls you can move about in front of them, touch them on the nose with and so on. Hand-eye co-ordination is need to pick a ball up, they're interesting to hold, to pass from hand to hand and to throw. Rolling or gently throwing a ball across the lawn to them is great fun for a 6 to 12-month-old and encourages them to do the same back to you. As well as co-ordination, stopping or catching a ball involves timing. The repetition reinforces the brain's learning. A larger, soft, plastic bouncy ball such as a beach ball will keep 1-year-olds entertained, especially once they start walking. Balloon tennis and volleyball gets them moving once they're walking. From about 18 months, ball games can become a lot more sophisticated, and once they start being able to throw and kick them with some sense of direction and control, they're on the path to rugby, soccer, netball tennis, squash, golf - you name it. Pretty much all of us become hooked on ball games of some sort for life. Blocks and variations on blocks are also a staple for any toybox, so, for outdoor summer fun, substitute cardboard cartons and boxes of all sizes. They are great for hiding in and you can build bigger towers - and get bigger collapses.